If you’ve found yourself with an overflowing collection of wine corks thanks to your evening wine habit, you’re not alone. Wine corks are a hot commodity in the world of crafting, with many people paying to get their hands on some. Of course, the most obvious choice is to make a cork board for your kitchen or office, but the options extend far beyond the obvious. We’ve rounded up some great ways to make use of your corks that will make drinking wine more eco-friendly than ever. 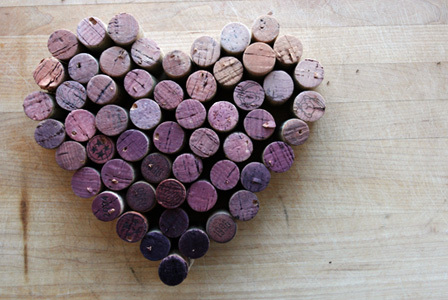 Form wine corks into shapes like hearts or even letters to give as gifts or to decorate your home. If you keep the wine-stained side pointing out, it can make for a fun effect. The heart in the above photo from Lovely Morning would look adorable in any room of your home! 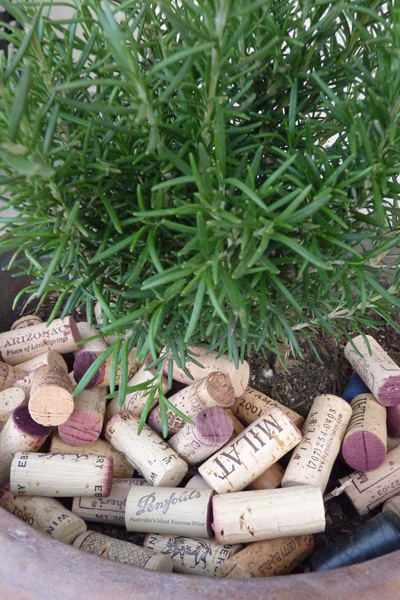 Wine corks are an excellent mulch for potted plants or small beds. Cork is a natural product, so it will break down over time and it is a natural anti-microbial, so it should resist mold growth. Like other mulch, the cork will help hold in moisture and will add a little flair to your pots and beds. For best results, break up the cork and add that to your planters — but you can also simply add a layer of full corks. You can also use corks and wooden skewers to create labels for your herbs and other plants. All you need is a permanent marker and you’ll have labels that will hold up in various weather situations. Next time you’re putting together a package, instead of filling it with plastic bubble wrap — or worse, those Styrofoam peanuts that are both a mess and no friend of the environment — try filling your box with corks. They provide the perfect padding for fragile materials and are much cuter to open than a box filled with plastic. If you aren’t a big wine drinker but want to try your hand at making some wine cork crafts, consider asking a local restaurant or bar if they would be willing to save corks for you. In addition, some grocery stores or craft stores collect wine corks from the public and then sell them for a small fee. Of course, we’d recommend simply becoming a wine connoisseur. Corks are the perfect decor piece for wine lovers or anyone who appreciates natural elements. Some people have gone as far as creating backsplashes and even flooring entirely out of wine corks. Other options include using wine corks to fill vases or to fill around candles in larger containers, using them as drawer pulls or even creating a bathmat, as shown in this tutorial on Crafty Nest. 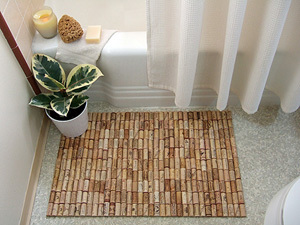 Because cork is a natural anti-microbial, they will hold up well in moist rooms like your bathroom or laundry room. The options are endless when it comes to corks and crafting — the only limit is your imagination. 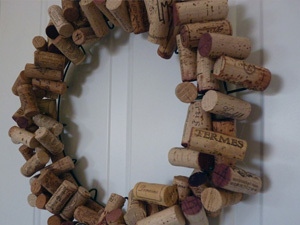 From picture frames to coasters to art pieces to wreaths for your door, corks offer a variety of options. Try making a bird house or even create a table top using only wine corks. Boxed wine handbag: Genius or crazy?